Vans offer up this double pack of chambray polkadot Era's from their Fall 2013 California collection. Vans California (our favourite range in the Vans arsenal) announce this four pack of twill Era CA's with leather laces. Vans continue to give the luxe treatment to classic models with this vulcanised 106 from the AW12 California collection. 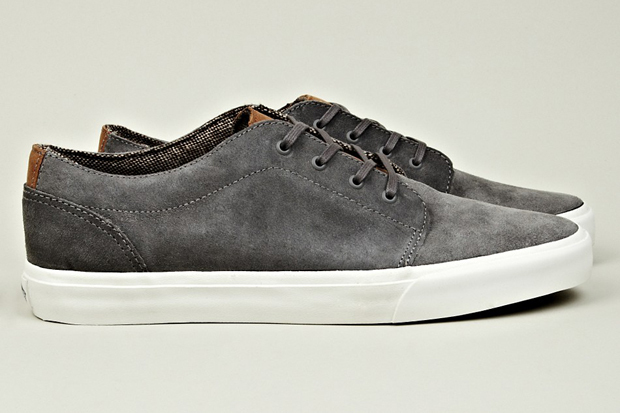 For Fall '11 Vans introduce this new take on the classic Chukka. The Chukka Decon is basically a Chukka boot but with a more elegant finish, and a premium feel and aesthetic. There's no doubt Vans' California range has been the go to option for those seeking more of a premium look and feel to their Vans footwear, and this release is another fine example of why. This new release which is part of the California collection, see's heritage favourite the 'Sk8-Hi' gets some premium treatment with this new black/black make-up.